Panettone, or pan dulce as my Argentine mother calls it, is one of my family’s favorite things that I make. For those of you who don’t already know, panettone is the queen of holiday fruit bread. Shaped like a chef’s hat, fragrant and puffy with yeast, sweet with fruits and honey. 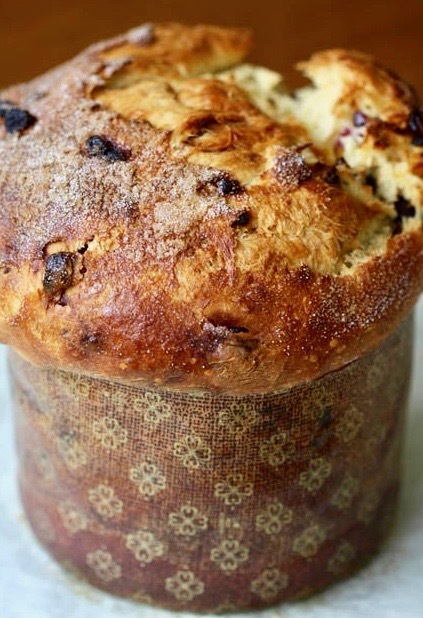 Heavenly Panettone that even my cousin who lives in Italy says is the best she’s ever tasted! My loaves aren’t cookbook perfect and I never make the exact same twice. All the same, each of the dozens of times I’ve made this, it’s come out divine. I use Lahey’s baking technique of using a covered pot. For the first half of the baking, I leave the lid on. For the remainder, I take the lid off. Instead of a pot like Lahey uses, mine is the ceramic interior and glass lid from my electric crock pot. I don’t wrap the baked loaf with fancy printed paper. I use parchment paper to line the baking pot. Half a recipe works equally great, though leftover baked panettone freezes well. Whole wheat flour substitutes nicely for half of the white flour. More fruit and/or nuts, less fruit and/or nuts — it’s all delicious! For a lighter loaf first measure dry ingredients into a separate bowl, including the dried fruits and nuts. When I tried adding the raisins into the butter as it melted, it made the loaf denser. 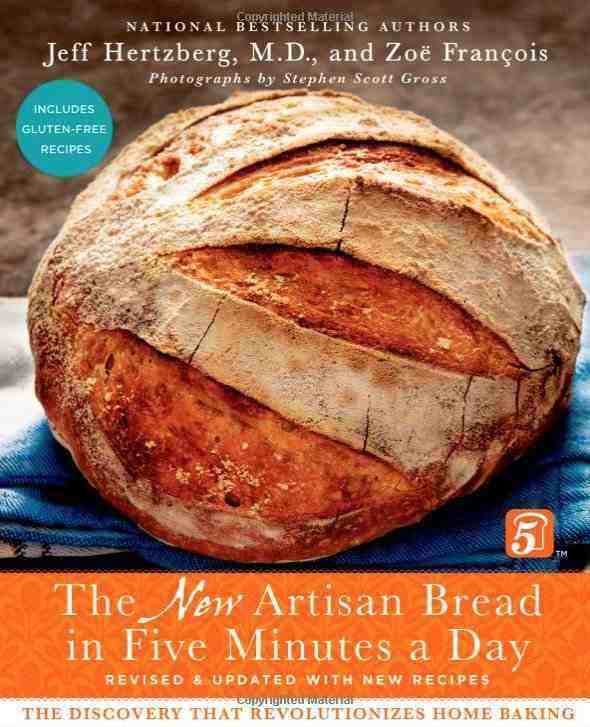 Here’s my post on “The New Artisan Bread in Five Minutes a Day: The Discovery that Revolutionizes Home Baking,” by Jeff Hertzberg, M.D., and Zoë François. 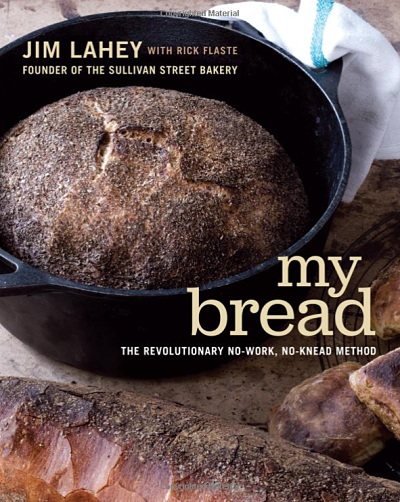 Here’s my post on “My Bread: The Revolutionary No-Work, No-Knead Method,” by Jim Lahey. Dear Da-Al: good morning. It seems that your article on “panettone” has drawn a lot of attention. It has a very romantic and quasi-mythical origin in an unfulfilled love relationdhip in Milano during the Middle Ages. I will prepare an article this weekend and I will post it in my page on Monday at 7 AM Eastern time. would love that, dear Mario – pls let me know as soon as it goes up – would it be ok to reblog here? Of course you can re-blog it dear Da-Al. I’m all yours, in flesh and spirit.